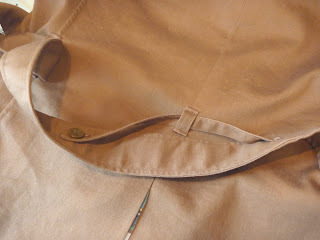 The Japanese Pattern Challenge: Safari -- A whole lotta hand sewing! Safari -- A whole lotta hand sewing! We've had some pretty miserable weather recently. So it's been a good time to stay in, watch season 2 of Downton Abbey and do a ton of hand sewing. So here's a glimpse of what's going on with the safari jacket. This is a hemming technique from my old pal Edna Bishop. Parts of it are a PITA, but the end result is worth the effort. 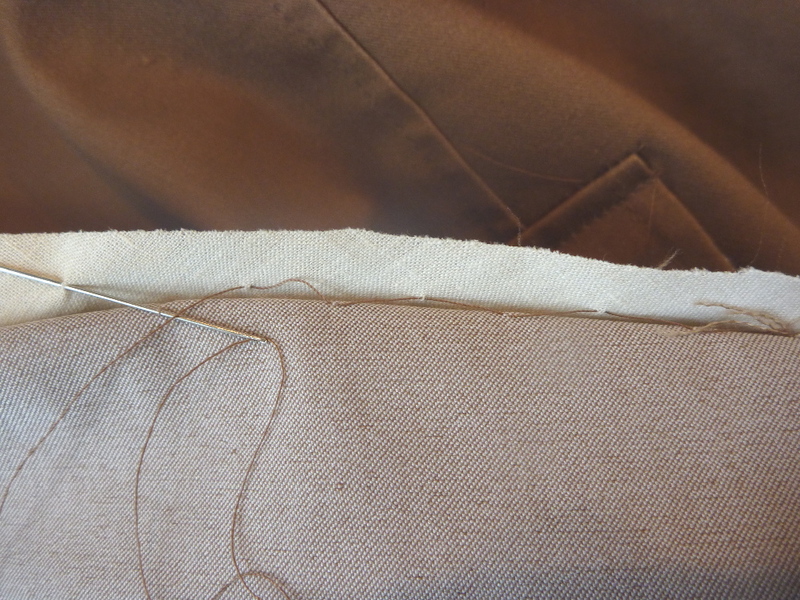 The jacket hem is 1.5", so a 2" wide bias strip of muslin is tucked down inside the hem. 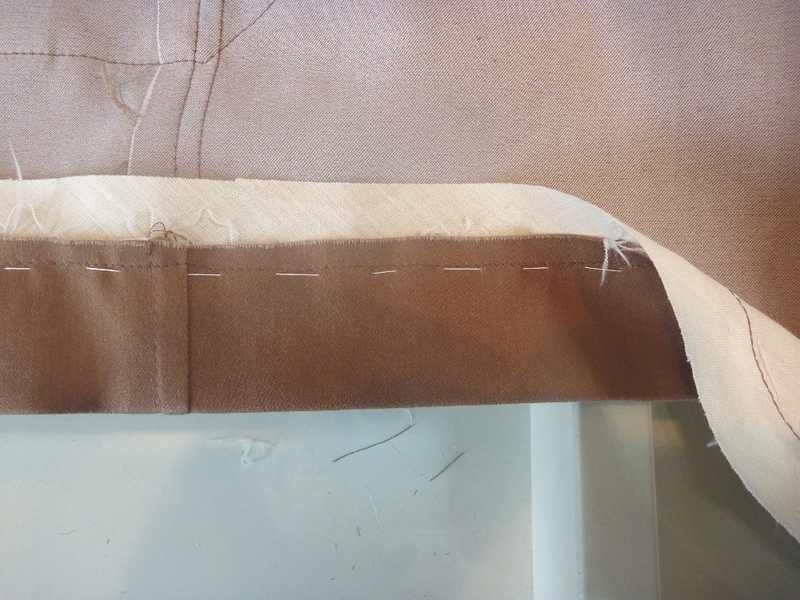 The two pieces of fabric are then stitched together with a 1/4" seam. I find it easiest to baste first (of course). I only have one foot for my Singer 310, so the 1/4" stitch requires me to pass the whole jacket through the middle of the machine. It's cumbersome, but possible. 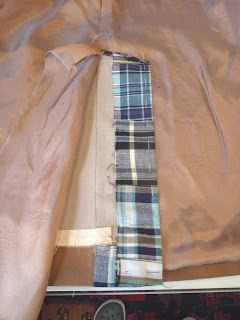 The jacket fabric is folded back and hemmed into the muslin using loose 1/2" stitches. 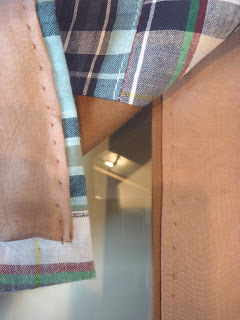 The hem will be virtually invisible from outside the jacket. 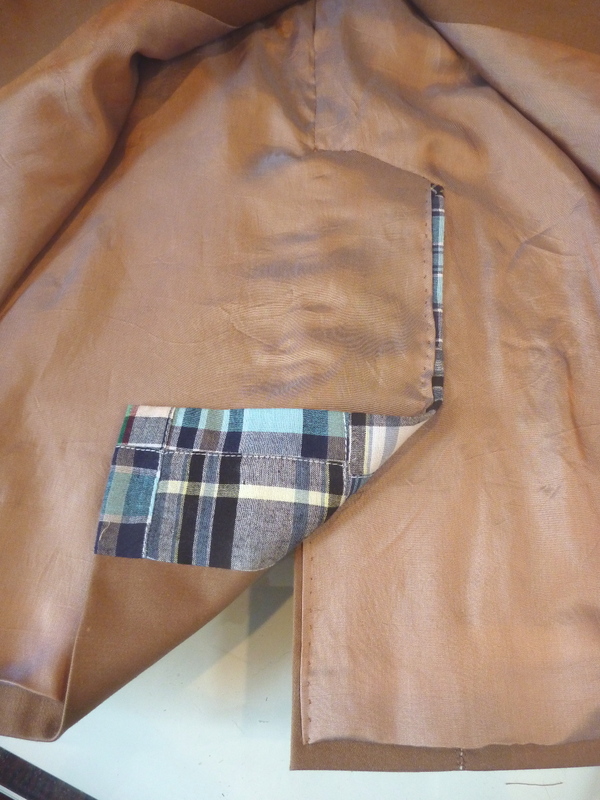 While I still have access to the inside of the coat I tack down the edges of the patch pockets. 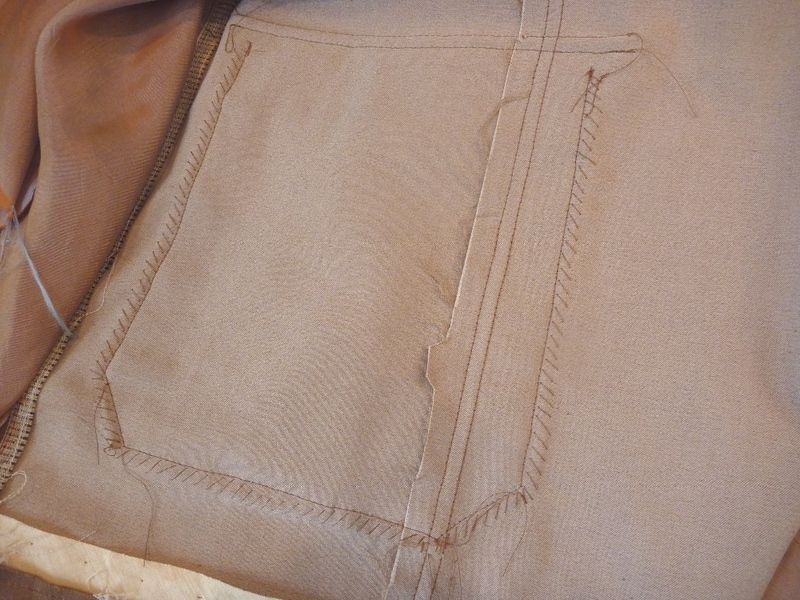 I don't know about you, but I hate the "flaps" around pockets that have been stitched on with 1/4" topstitching. The time spent on this next step is worth it to me. Working from the backside of the jacket I make diagonal stitches around the pocket. I can feel with my non-sewing hand where the edge of the pocket is, so these stitches move along quickly. Sometimes I "go too deep" and a little stitch will show on the front. I just clip it out and throw in a few more stitches. It's all covered up with the lining, so no one has to know. I refer back to my Roberto Cabrera tailoring book when it comes time to do the back vent. I always feel that I'm just muddling along. (Which I am!) The right half of the vent is easiest to deal with. The center back seam of the lining just continues down the back flap very close to the edge. The other side is always a challenge. 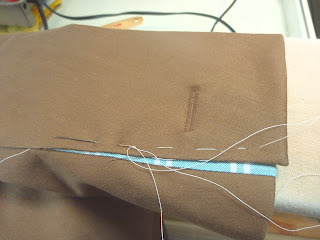 I work the lining across the bottom hem starting at the jacket front. As I approach the vent it becomes clear what has to happen. I just keep pressing and basting until it works. Here's the completed vent and lining. I like to finish it off with pick stitching. I want some of the contrasting sleeve vent to show. So I've opened it out slightly and basted it into position. The sleeve lining, and to some extent the button, will hold the vent open. 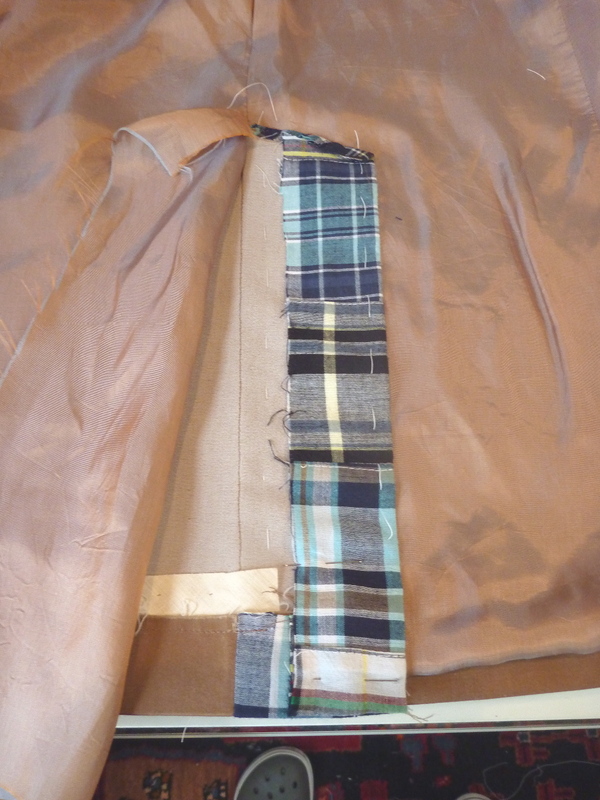 This is a little belt restraining strap that prevents the belt from being separated from the jacket. The Japanese trench coat has this feature, so I duplicated it here. Now all that's left is to sew on the buttons and clip all the loose threads. Hopefully I'll be able to model the finished jacket next week. That looks great! The contrast vent detail is a big risk, but it looks like it's paying off. Happiness is..... The completed safari jacket!